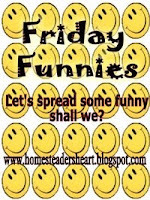 My friend Kim at Homesteader's Heart hosts Friday Funnies. It's always nice to get a few laughs in your day! She asked us to try to have Thanksgiving themed funnies today. I looked around and found a few short Thanksgiving jokes to share. Oh, and don't forget - you have until Sunday evening 11/23 to enter my doily giveaway! OH those were cute! I loved them. So because my blog is on lock down I couldn't post my post until I got up but it's there now, however Mr. Linky is on the fritz so you have to leave your URL to this post in a comment. What a pain lol. Now these were really funny!!! I loved these jokes. Wish my grandson was a little older to understand them all. I love the fowl play one!!!! Oh they made me giggle..don't worry! Loved them! GOD BLESS YOU ABUNDANTLY! P.U.S.H. I'm stuffed!!!! HAHAHA That is too cute!